Joshua Holmes, Sophomore, ready to serve! Six members of CARP Cypress, myself (Joshua Holmes), Ori Morton, Isaac Yusuke Takeu, Harumi Muranaka, Dimas Soto, and Brandon Taga, took initiative to build bonds with our professors and our school and had amazing results! Before school officially started, Cypress College volunteered at the Welcome Back/Orientation for the professors, students, and faculty on Friday, August 25. We originally hoped to perform the MuJoGeon dance, which we learned and performed in New York at Mother Moon’s “Peace Starts With Me” Rally. Even though we didn’t get a chance to do that, we still wanted to offer something! We connected with the Student Government (Associated Students) on campus and volunteered to help them with the food booth at the Orientation. We were the only club who had reached out and asked to help and, therefore, the only club officially represented at this event. Our intention was to serve the professors and students on our campus. We wanted to start the year off by showing that CARP Cypress appreciated the work of the professors and that we were ready to serve our campus community (that’s the reason we wanted to perform the MuJoGeon dance: because it was about unconditional service)! Secondly, we wanted to put our name out there and start the semester off with a bang! Harumi Muranaka working at the booth. We were able to develop powerful relationships with the Student Government. We got there half an hour earlier than the Government Officers did; even before they arrived, we were helping to set up tables. It turned out they were very understaffed for this event, so they were extremely grateful to us. CARP stepped in to help in many areas so it felt like we were also part of the Student Government. Through our sincere effort to support and offer ourselves, the Student Government responded with gratitude and were also inspired by the message and mission of CARP. Many expressed that they wanted to join and even invited their friends or peers to come and listen to what we had to say! (Left to Right) Harumi Muranaka and Ori Morton setting up for the event. We had many opportunities to connect to new students. While serving food, people (including parents who came to the Orientation with their children) asked about CARP. Isaac, a core member at CARP Cypress, went around to connect to other students, and even, on one occasion, sat down with a new student who looked lonely. Additionally, Isaac and I had the chance to reach out to the Campus Christians that had a booth nearby. We listened to their visions and had a chance to share about CARP’s current focus to reunify North and South Korea and our dream to bring people of all faiths together centered upon God. They expressed interest to work together to create something powerful on campus. Joshua Holmes serving professors and repping CARP. I could not even count the number of professors that asked us what CARP was when they were waiting in line for food. All expressed interest in our mission. However, our biggest surprise was when the President of Cypress College, Dr. Schilling, came up to Ori and Isaac and asked about CARP. Ori Morton posing by the cookies. 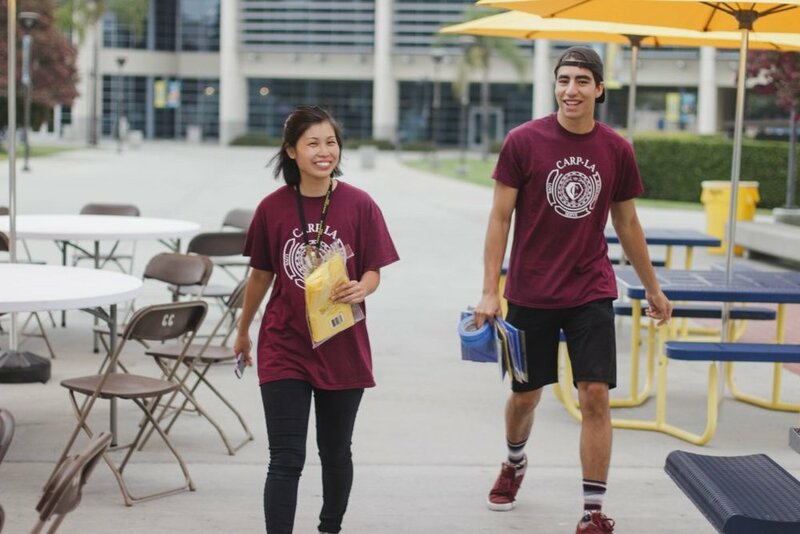 One of CARP Cypress’s goals is to develop positive relationships with professors on campus. We want to inherit from Father and Mother Moon’s dream of having a powerful impact on campus through both students and professors. In that respect, I think we achieved part of our goal! In the end, we realized that God is definitely moving here at Cypress. Although the initial vision for performing the dance was lost, because we were motivated and determined to offer something beautiful to the people here on campus, God could find a way to open up another door! In the next few weeks, CARP students and chapters will be heading back to school! The CARP spirit is to serve– stay tuned for more ‘back to school’ stories and be part of the fun! Join CARP and make a difference on your campus!